I’ve been reading a lot about generosity in preparation for leading a retreat on that subject this weekend. The books have ranged from informative (The Paradox of Generosity: Giving We Receive, Grasping We Lose) to challenging (The Life You Can Save: Acting Now to End World Poverty) to inspiring (More or Less: Choosing a Life Style of Excessive Generosity). Each of them has invited me to re-evaluate the way we live. And the way we give. 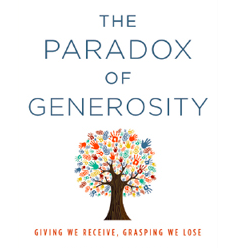 Christian Smith and Hillary Davidson, researchers at Notre Dame, identify various types of generosity: Giving money, volunteering, neighborly generosity (watching someone’s house when they’re away, etc) and relational generosity (being generous within one’s extended family). They found that generous Americans experienced more health, happiness, purpose in life and sense of well-being. Despite this, they also found a surprisingly high percentage of ungenerous Americans who live in fear of not having enough for themselves down the road. Peter Singer’s provocative book, The Life You Can Save, presents compelling arguments for doing more to address world poverty. He also explores and debunks some of the reasons people don’t give, including feeling that the problems are so huge that my little bit won’t make a difference. While he doesn’t set out to send us on a guilt trip, it’s hard not to feel guilty when our restaurant spending over the course of a year could easily save the lives of several children. So where does all of that leave Bill and me at this stage of our lives? We have been exploring the question of what’s enough space. Living in one room in a community has been fine. At some point we’ll move into an apartment where it will be easier to offer hospitality, one of the things we most enjoy. We will probably never live in a large house again, unless it’s in community. A two bedroom apartment feels like enough. Owning a car in our current circumstances may be an excess. A tougher question: As our ability to earn more diminishes, how much money is enough? And which of the many needs — ranging from our kids’ student loans to the life and death needs of children around the world — are we called to address? How are you deciding how much is enough? Where would you like to contribute more? This entry was posted in Books and reading, Generosity and tagged Posted by Carol Mitchell. Bookmark the permalink. Thanks, Tom. I’ll check it out. Another interesting question – where do we give? I don’t have the data on this but I recall reading about charities close to home do better than donations overseas because people trust domestic based charities vs. the waste perceived in international organizations. I don’t think American charities are any more or less corrupt than international groups. And your money goes a lot further overseas. Thanks for raising that issue. There are some interesting web sites that investigate and rate different charities. The one’s I’ve explored are Give Well (http://www.givewell.org/) and Charity Navigator (http://www.givewell.org/). One of the things I like about Charity Navigator is that you can look up how much money goes to programs vs. administration. It also reports the salaries of the CEOs. I personally have a problem with charities whose CEOs make in the range of $400,000. But I do know an argument can be made for attracting high level professionals. However, Partners in Health, for example, seems to perform very well with all salaries under $200,000. I worry about my own future needs. When I want to give a lot now, I start worrying – what will happen if I get sick in ten years and really need this money? Haven’t figured out how to deal with that one, since I tried but couldn’t get long term care insurance. (I’m 60 now and have had cancer and other health problems so feel as if it’s quite possible I will need expensive health care down the road). Thanks for raising this issue. Bill and I are 67 and also don’t have long term care insurance, so it is a worry. As I explore being drawn to give more, I wonder about funding that by giving up some meals out or fancy coffees or using the library instead of buying that book I really want to read right now. Sometimes it’s tempting to feel like little contributions don’t make much of a difference, but I do think they add up and have an effect.